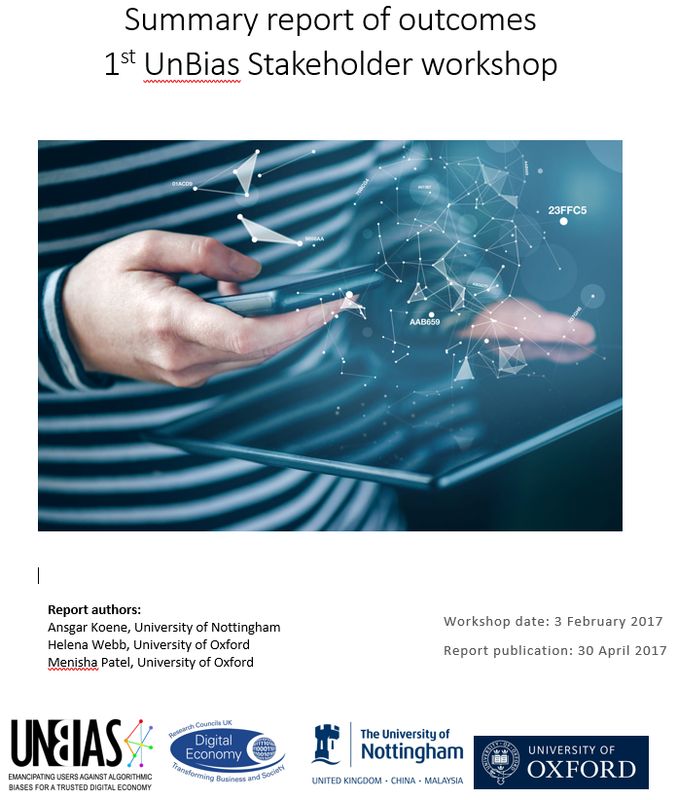 This Web Science 2017 workshop, delivered by the UnBias project, will be an interactive audience discussion on the role of algorithms in mediating access to information online and issues of trust, transparency, control and responsibility this raises. The workshop will consist of two parts. The first half will feature talks from the UnBias project and related work by invited speakers. The talks by the UnBias team will contrast the concerns and recommendations that were raised by teen-aged ‘digital natives’ in our Youth Juries deliberations and user observation studies with the perspectives and suggestions from our stakeholder engagement discussions with industry, regulators and civil-society organizations. The second half will be an interactive discussion with the workshop participants based on case studies. Key questions and outcomes from this discussion will be put online for WebSci’17 conference participants to refer to and discuss/comment on during the rest of the conference. The UnBias project investigates the user experience of algorithm driven services and the processes of algorithm design. We focus on the interest of a wide range of stakeholders and carry out activities that 1) support user understanding about algorithm mediated information environments, 2) raise awareness among providers of ‘smart’ systems about the concerns and rights of users, and 3) generate debate about the ‘fair’ operation of algorithms in modern life. This EPSRC funded project will provide policy recommendations, ethical guidelines and a ‘fairness toolkit’ that will be co-produced with stakeholders. 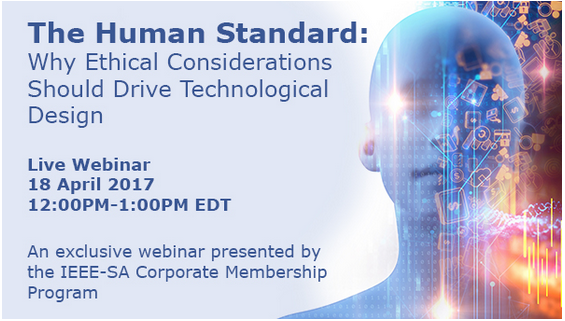 The IEEE Standards Association (IEEE-SA) Corporate Membership Program invites you to join an exclusive webinar. In the age of autonomous and intelligent machines, it is more important than ever to help technologists and organizations be cognizant of the ethical implications of the products, services or systems they are building and how they are being built before making them available to the general public. While established Codes of Ethics provide instrumental guidance for employee behavior, new values-centric methodologies are needed to complement these codes to address the growing use of algorithms and personalization in the marketplace. Speakers will provide their perspectives on why it is important for business leaders to increase due diligence relative to ethical considerations for what they create. This focus is not just about avoiding unintended consequences, but also increasing innovation by better aligning with customer and end-user values. Senior Research Fellow at Horizon Digital Economy Research institute, University of Nottingham. Co-Investigator on the UnBias project and Policy Impact lead for Horizon.